You may remember our post from earlier in the month about how we decided to dig in and add long-term improvements to our homestead this year. Last week we wrote about visiting a goat farm and today I'd like to share what we learned on our recent trip to a local winery. Since we have decided to plant a small vineyard this year, we figured it would be wise to get advice from someone experienced to help us decide what types of grapes to plant, where to plant them, and how to set up the vineyard. One of David's fellow teachers at Puxico is the owner of a winery in town called Indian Hills Winery, and earlier this month he invited us out to learn more about grapes and the wine making process. The winery is located on beautiful land in the country with rolling hills and a nice pond situated on the edge of the vines. We first got a lesson on how to build fences to support the vines and David asked a lot of questions. I tried to pay very close attention but there were a couple of sweet pups following us around and I couldn't help but pet them a little and take some photos! It turns out they weren't there just to be cute. Martie said that having several dogs in the vineyard is the best solution he has found to prevent deer from munching on his prized vines. We are keeping this in mind since we often see deer on our property and don't want them to be a problem. Next we got a demonstration on how to prune vines. We headed over to several rows of Concord grapes, which is probably one of the more well-known varieties. Martie isn't too keen on them though because the vines tend to grow wildly each season and are hard to manage. I was surprised at how much is actually cut off in the pruning process, but the majority of the wood produced in the previous season should be removed. This is a necessary step to allow for new growth in the upcoming season and yield a better harvest. 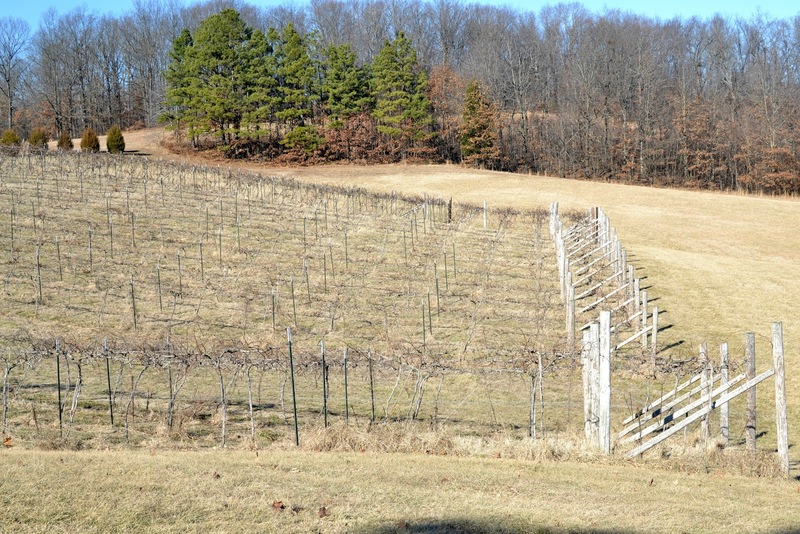 Pruning is done when the grapes are dormant, between January and March each year. After we were well versed on the fencing and pruning of the vines, we went inside the distillery to see how Martie turns all those grapes into wine. We got a taste of some of the wine in process before any sugar or other additives were mixed in. It was a little dry for my taste as I do like sweeter wines, but it was neat to be able to taste it at this step and see how different it is from the final product. David asked about how much wine they produce from their vines, and I was surprised to learn that from 1,200 vines they can get anywhere from 5,000 to 7,000 bottles of wine per year. Each vine produces about 30 pounds of grapes and it takes around 15 pounds of grapes to make a gallon of wine. We learned so much and after our visit to the winery felt more confident in purchasing our own grape vines. So we came home and did just that! We have 32 Chambourcin, 8 Marquis, 8 Canadice, and 8 Lakemont vines coming to us this March. Martie has had good luck with his vines ordered from Double A Vineyards so we decided to get our grapes from them as well. Now we are working on clearing a spot for the vineyard behind our house at the top of the hill. The process of logging our property in 2012 made a mess up there, so we need to clean up the branches then get to work installing our fencing system for the vines to be ready for planting this spring. I am so excited to be moving forward with our goal of having a small vineyard and glad that we decided to get several different varieties of grapes. The Chambourcin grapes are good for making wine, and the others are perfect for eating off the vines or making jams and jellies. Lakemont grapes even make excellent raisins! I can't wait to have loads of grapes to work with. Many thanks to Martie for sharing his knowledge with us and answering all of our questions. If you are ever in Southeast Missouri, please do stop by Indian Hills Winery. You will enjoy your visit! Sounds wonderfully exciting Tammy! You may need to buy more land if this becomes as successful as I know it will for you both! So fun also to have to buy several more dogs to "protect" your vineyards!! really great that you had a resource to learn directly from! invaluable, i'd say! How exciting! I can't wait to see the process. I'm also surprised at the hard pruning those vines take. Enjoy the journey, Tammy! You are movin' on up! Wow, how awesome that you were able to get tips from the pros! Are you guys planning on making your own wine??? I am really encouraged with how you went out to learn more from folks who already have goats ... grapes ... that is awesome. It encourages me to always dream, ask questions and learn. There are several wineries here in New England, but I have yet to visit any of them. Chris & I have talked about it, but never actually done it. You've inspired me to try to pin him down for a date to one soon! Sounds fascinating! I have fond memories of eating grapes off the vine when I was a child. Our neighbor grew just enough to enjoy off the vine and for wine. I grow other fruit, but haven't tried grapes. Yet. This sounds so fun (and like a lot of hard work!!!) and I am exicted you are taking the plunge into a vineyard! Hooray! So happy for you. One of the winery's by us is a sweet young couple who started making their wine from his uncle's vineyard. I find the entire process amazing. Sounds like you guys are going to be very busy this year!! My husband makes a lot of wine, but he just buys the fruits or picks wild wineberries/strawberries to make it. Sounds like a fun adventure you have ahead! Exciting! Mitch's brother, who lives down in Rochester, has been successful at growing grapes on their little lot in the city, and we have a friend up on the MN/Canada water boundary that has his own vineyard - a bottle of his homemade wine is in our fridge! We stayed up there a couple of times this summer, and the cabin we were in was right next to the vineyard - I loved watching him work on it & seeing the grapes grow over our summer visits. So cool!!! I look forward to seeing yours flourish, too! Oh, this sounds wonderful. I hope you are wildly successful. What a fun new project. :) Of course, we'd love to purchase a bottle or two when you get up and running. Sounds like another adventure..... I think it will great. Lots of work I know but the results will be worth it... Have a great day! Blessings! What a wonderful venture Tammy, I wish you the best of luck! I love all the amazing things you have planned for this year! You two are a perfect match! Can't wait to hear all about it!
. that is great to be able to follow your dreams. it's going to be exciting to see yall's progess with the vineyard. can't wait to see yall's next stop. I really like how you both are opening yourselves up to different ideas. LOVE the wine idea! I LOVE this!! It has been Stu's lifetime dream to have a small vineyard and experiement with wine-making. He would absolutely love to do something like this. Looks like so much fun but also educational as well. The pups are so cute! Wine tasting and the lands that the grapes grow on is one one of my all time favorite field trips. In fact my sis in law and I are planning a get away down to Temecula for a girls birthday rendezvous to go wine tasting. So I'm very exciting for you and David. I love raisins, wine, and jam!! I'll be your first customer on any one of these goodies!! I have some slight misgivings about this new venture—at least the deer fencing bit you mention. You've got to bee careful there. In the first place, it's hardly fair, because if you involve fencing as your main means of keeping out deer, the poor things, having hoofs, can't possible hold a sword properly. Also, if it turns out to be a buck you're up against, he will have some huge antlers against which a flimsy fencing sword can do very little. These are things I’m sure you’d have heard about in more detail, had you not been distracted by the dogs at that vineyard. Just think carefully before investing in any fencing equipment. (I can recommend an excellent book on fencing, but I’m not sure it will help. There is no section on deer.) The only advantage I can see is that the fencing costume looks very much like what they wear in bee-keeping; so you wouldn’t have to change too often when bee-hiving. I have heard that geese are very good guard-animals too, so you wouldn't have to have too many dogs about the place if you decided to have some creatures guard your vines, just invest in geese. Then you could have eggs too. Wow - you are going to be a full service farm! We have tons of wineries here in Oregon and they're so much fun to visit. Good luck on your latest endeavor. This is on my to do list too for this year (again, sister from another state with our parallels!). We have some sort of tiny green grape and lots of concord grapes growing all over. They need to be organized. I hope I'll be brave enough to prune that much. It makes me nervous! What are you going to use to stake them? Trelis, posts/wires? Something else? I love that you make such good use of your land!! GL w/your upcoming plans on this!! Maybe someday we'll be paying to take a tour of your property. Wineries are great places to visit!! beauty of nature........what a lovely way to live life. What fun this must have been Tammy! We enjoy visiting/touring our local wineries in Eastern WA. It's fun to receive an inside tour :) How exciting to start a vineyard! Tammy, how exciting to start growing your own grapes. The tour of the winery is neat, I love the cute puppy dogs. Good luck, I wish you all the best. We planted 30 vines about 10 years ago and it's always a treat to see them produce each year. How exciting for you! Good luck with your venture. It will be fun to see it develop. What a fun visit. Those pups are adorable. Good for you. It sounds like it will be a great experience for you. I am happy your dream is comming true. Wine making is a lot of fun! My family used to make our own many years ago. We had several wooden barrels, an old wine press and twenty 5-gallon glass bottles that we used to make wine for the year and for gifts. We purchased the grapes and fermented them in barrels in the basement. I think the best part was tasting it between presses :) You guys are very ambitious, good luck with your vineyard! Wow I didn't realize you had to prune them back so far, but it makes sense. Must be a rewarding experience! You and David are so inspiring! I hope you continue to share on this project, as I am very interested in how it progresses. I know the deer would be a huge problem for us, and we would have to set up closer to our house than where we tried our Christmas Tree patch. Just more deer than our dog can handle! A couple of years ago a friend and I stayed with some other friends in St. Louis. We went out for a drive west of the city to some beautiful country. We passed a few vineyards but most weren't open for tastings as it was mid week. If you need a guinea pig for wine tasting, I can help you out. I like sweeter wine as well! Love the pics and the doggies are cute. I am excited for you guys, not only are the vines gorgeous to see sprawled across the land but they are such a multi purpose fruit and wonderful. I'm looking forward to seeing you guys learn and progress as you "dig in". I miss our vines but we are hoping to plant again in the future along with another fruit orchard..One bummer about moving :). a wonderful, interesting and informative post you shared! thank you. what an absolutely awesome project you're doing, my friend! oh, those darling pups! good luck! wishing you the very best! Currently travelling in SA with all their stunning wineries but have not been able to tour a vineyard because of the kiddoes. So really lovely to learn about some of the processes here. I had no idea they grew like that. Hi Tammy, I enjoy your blog so much. I am enjoying reading back through the months before I found your blog. This is fascinating about your own vineyard. We have a place called Jaemor Farms near us. They grow their own "everything." We always enjoy visiting there and bringing home delicious fruits!